Did any music of lasting worth come out of the early ’80s ‘New Age’ boom? Mark Isham’s brief but inspired Windham Hill catalogue surely still cuts the mustard. The trumpeter/keyboardist/composer’s Vapor Drawings, released 35 years ago this weekend, was a remarkably assured, fully-formed debut album, recorded when he was part of Van Morrison’s band and also enjoying a varied session career. I distinctly remember hearing a track from it in the mid-1980s on a short-lived ‘new age’ BBC radio show whose name escapes me. And weirdly, Isham mixed the album 100 yards from my childhood home during spring 1983, at John Kongos’s Tapestry Studios. Synths are Vapor Drawings’ main ingredient but Isham uses them in subtly original ways, using sequencers to build Steve Reich-inspired ‘systems’ or – one of his trademarks – getting them to hang in the air like sky lanterns. The music defies categorisation, mostly hovering in the hinterland between ambient, minimalism, electronica and jazz (he even throws in a quote from Sonny Rollins’ ‘Oleo’ on ‘Raffles In Rio’). But there’s always the human element courtesy of his superb trumpet and piano playing. Erik Satie is also an apparent inspiration, and possibly what David Sylvian picked up on when he invited Isham into the studio to record Brilliant Trees later in 1983. It’s no surprise Isham has become one of the most in-demand soundtrack composers of the last 30 years – ‘On The Threshold Of Liberty’ (named after a Magritte painting), ‘Men Before The Mirror’ and ‘Sympathy And Acknowledgement’ are epic and rousing. ’83 proved to be a bit of an annus mirabilis for Isham, hooking up with Sylvian and also working with Gil Evans at the Montreux Jazz Festival. 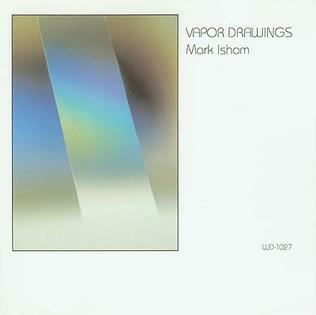 Vapor Drawings is the first and best of his solo albums. Happy birthday to an unsung classic. Stanley’s music first grabbed me sometime in the mid-’80s. It was the bassist/composer’s 1974 self-titled album featuring Tony Williams on drums, Jan Hammer on keyboards and Bill Connors on guitar. It fair blew me away; with hindsight, it was a near-perfect combo of Coltrane, Hendrix and Bootsy. Clarke remains a hero – I still greet his new albums with some enthusiasm and his career seems to have enjoyed a new lease of life over the last 10 years or so. 2006’s Toys Of Men was a huge return to form, and releases since then have been prolific if less impressive. Which brings us to Stanley’s new album, The Message. It continues his tried-and-tested formula: some sh*t-kickin’, symphonic jazz/rock, vocal-based R’n’B, acoustic interludes with a classical bent and brief novelty curios featuring some guest star or other (this time Doug E Fresh on rapping and human beatbox). On previous classics like School Days and If This Bass Could Only Talk, the formula worked a treat. But this time, besides the typically great playing, there are a few issues – with Stanley’s production, compositions and ‘message’. The opener ‘And Ya Know We’re Missing You’ is a tribute to all of the following: Al Jarreau, Ndugu Chancler, Tom Petty, Chuck Berry and Larry Coryell. It sounds suspiciously like a demo, complete with distortion and rudimentary ‘slap in E’ groove. In other words, it’s the kind of thing Stanley can do in his sleep. Sure, he can pay tribute to whoever he likes in whichever way he deems suitable, but this seems a really uncommitted two minutes of music. A re-tread of the Return To Forever classic ‘After The Cosmic Rain’ also emphasises the problem with contemporary production – compare it to Stanley’s 1999 version with his Vertu supergroup. That version had balls, low-end, dynamics, space. The new one sounds hemmed in, dried out, panicky. Drummer Mike Mitchell must take some of the blame too – he has perfected the lightning-fast single-stroke rolls but they get boring very quickly. It doesn’t help that he tunes his drums to choking point. There are substantial pieces of music here: the title track, ‘The Rugged Truth’ and ‘The Legend Of The Abbas And The Sacred Talisman’ are great compositions which bear comparison with Stanley classics like ‘Light As A Feather’, ‘Life Is Just A Game’ and ‘Song To John’. The acoustic-bass take on Bach’s Cello Suite is gorgeous too, but a few other tracks are beyond help – the treacly ‘Lost In A World’ and ‘To Be Alive’ irritate, while only Stanley knows what’s behind ‘Combat Continuum’, a nutty futuristic spoken-word/fusion piece about impending war. I preferred his preposterous, sci-fi-influenced outbursts on 1978’s Modern Man. What a shame. It could have been a classic, but The Message has 5/10 written all over it. It’s definitely one for filleting on streaming services though, and I’m sure the music will come alive in concert. The Message is out now on Mack Avenue.